Fellini | poemless. a slap in the face of public taste. Over the holidays I went to see the film Nine, which I had been waiting for in lustful anticipation for months. Rob Marshall, the director of Chicago, in an homage to Federico Fellini? To my sensibilities, this concept should make those like “heaven” or “nirvana” resemble a day at the dmv by comparison! I went to some fancy film school, or rather a fancy school where I majored in film. My original intention was to make films. Films like 8 1/2. Then I got distracted by the role of cinema in the creation of national identity and then I got distracted by Russian lit. During the autumn of 1993, however, my impressionable young mind was enrolled in a class on Italian cinema. At some point 8 1/2 became something more than a movie, a symbol of everything cool & genius. Fellini was a god, and 8 1/2 a bible. My friends and I knew we could never attain the cool & genius of Fellini, but accepted our moral obligation to try. Our prophet died that autumn as we sat in class discussing his work. At the risk of taking this analogy far too far, I had one of those religious experience things people talk about when I learned that he had died, one I think I will keep to myself. It was All Saints’ Day. I was at the beach. There is something about walking along an empty shore on a cold grey day… I still have a flower I picked that day. Nine is a 2009 musical-romantic film directed and produced by Rob Marshall. The screenplay, by Michael Tolkin and Anthony Minghella, is based on Arthur Kopit’s book for the 1982 Tony Award-winning musical of the same name, which was derived from an Italian play by Mario Fratti inspired by Federico Fellini’s autobiographical film 8½. Got that? It’s a movie based on a musical based on a book based on a play based on a film based on Fellini. I want to make sure we’re all on the same page and no one is lost back at recursive exit 3, wondering what the hell is going on. For discussion’s sake, we’ll say that it is a movie based on a musical based on an autobiographical film by Fellini. But the movie (the new one) is about the original film. Except, it’s not really “about” it. But I’ll come back to that. “8 1/2 is the best film ever made about filmmaking.” ~Roger Ebert. “8 1/2 is the best film ever made.” ~poemless. Released in 1963, it is about a man trying to make a film but can’t due to a creative block. Also, he is surrounded by a bunch of eccentric people. In the end there is a circus. 8 1/2 is autobiographical, yes, but more accurately, self-referential. I think this fact completely justifies a movie like Nine. I mean, if you can make a movie about a man making that movie, wouldn’t an appropriate homage to the director be a movie about the man making the movie about man making the m… oh, I’ve lost track now. What I want to say is that it is both appropriate and consistent for the movie Nine to be made. In theory, it should work brilliantly. In theory, it should be delicious. Fellini said, “It is not memory that dominates my films. To say that my films are autobiographical is an overly facile liquidation, a hasty classification. It seems to me that I have invented almost everything: childhood, character, nostalgias, dreams, memories, for the pleasure of being able to recount them.” When we think of autobiographical film, we think of a chronicle of events which have taken place in the past and, upon reflection, form a cohesive narrative that provides some kind of lesson. 8 1/2 is not that kind of a film. It is only autobiographical in that it is about a real man making a real movie. And frankly, that’s the least interesting aspect of the film, in my opinion. The film is really about the psychology of the filmmaker, not as it is revealed through his actions, but as it can only be expressed through a film. And yet Nine takes the route of the traditional autobiographical movie, omnisciently observing the protagonist, judging his actions, tying the making of 8 1/2 into a neat, plot-driven story using every trick in the book from hero with a fatal flaw to moment of revelation that you watched the whole film lead up to for so long you no longer care you are there when you arrive. Blah. Not brilliant. Not delicious. Not an appropriate homage. The musical numbers I am less perturbed by. Ok, Daniel Day Lewis looks like a dork when he sings (when I think of Marcello Mastroianni, I don’t think “dork”) and the lyrics are lame and unmemorable. I can repeat by heart right now the entire soundtrack to Chicago. Ask me what was said in any of the songs in Nine … all I remember is the word “Italiano.” But the performances by the women ROCKED. They were dripping with fantasy and costume and erotica and glamour and unrepentant womanhood. Now we’re within sight of capturing something Fellini-esque. And I like that they took place on a stage on an unfinished movie set as Guido watched from the studio floor. Artifice. I get it. Not reality. I get it. This is what is going on in his imagination; these are the creative juices flowing. I get it. It worked. It was fun. I’m not sure these numbers redeem the rest of the movie. But I can appreciate how the Broadway show would be really entertaining. Marshall seemed to translate Chicago from stage to screen with ease, why not Nine? Perhaps the problem is that it had already been translated from screen to stage before he got hold of it. Leftovers can be yummy, but you begin to resent the dish after the 3rd re-heating. But I don’t think that’s the only explanation for why this movie irked me so. Chicago is about murderous chicks doin’ jail time and racy dances, and he made a movie about how fabulous they were. The thrill of the movie was its subversive decadence and glamour. I think this can be said of Fellini too. He lets the Church do the judging and allows his fantasy free reign. Is this not what we mean by the term, Felliniesque? So why is Nine so heavy-handed with reality and morality? Nine is a movie about how Fellini (or Guido, however you like it) is a philandering egomaniac who escapes into the arms of women and breaks their hearts in attempts to avoid confronting his creative block, who makes 8 1/2 in order to win the respect of his estranged wife. This is not the back-drop against which fabulous things happen; this IS what happens. Personally I have no idea what Federico’s personal life was like except that he and his wife were profoundly close at the end of the their lives. Moreover, it occurs to me that you could make this movie about almost any film director. Why is Fellini/Guido so remarkable a womanizer? And why should we accept the premise of Nine, which is that he is? And if we do accept that he is, why does Nine not ask … why? Because I could have answered that for them. The anima and animus are described by Jung as elements of his theory of the collective unconscious, a domain of the unconscious that transcends the personal psyche. In the unconscious of the male, it finds expression as a feminine inner personality: anima; equivalently, in the unconscious of the female, it is expressed as a masculine inner personality: animus. It can be identified as the totality of the unconscious feminine psychological qualities that a male possesses; or the masculine ones possessed by the female. The anima is an archetype of the collective unconscious and not an aggregate of a man’s mother, sisters, aunts, and teachers though these aspects of the personal unconscious can ‘contaminate’ the archetypes. The anima is one of the most significant autonomous complexes of all. It manifests itself by appearing as figures in dreams as well as by influencing a man’s interactions with women and his attitudes toward them, and vice versa for females and the animus. Jung said that confronting one’s shadow self is an “apprentice-piece”, while confronting one’s anima is the masterpiece. Jung viewed the anima process as being one of the sources of creative ability. Fellini/Guido does not simply “objectify” women in the contemporary jargon used to denote the belief that women exist only for the satisfaction of himself. Nor is his complex remarkably Oedipal/Freudian (which Nine suggests…) In Fellini’s films women represent the “anima,” that “female” aspect of the psyche which is expressed through freedom, wildness, tenderness, love, etc. Guido is a tormented, intellectual control-freak who feels trapped in a society in which he expected to produce work, make money, be successful, cow to the public’s demands of him. He doesn’t just run to women because he is a child who needs a mother or an adult unable to control his libido. He runs to them because the world they inhabit is better, or at least more interesting. It is the locus of the anima. Until they cease representing an untapped subconscious and begin making demands on him, of course. All that said, I do think that if Nine gets anything right, it is the women. If 8/12 is about a man in pursuit of his anima, Nine is about women who have found their animus. The casting (apart from Nicole Kidman, which is almost criminal, really) is perfect. The depictions … I don’t know how they pulled it off. How do you turn the worlds’ most glamorous, beautiful women into characters who look like … real women (apart from Nicole Kidman)? These girls weren’t airbrushed (apart from Nicole Kidman). This was a celebration of women who have curves, circles under their eyes, raw sexuality, makeup that looks like it has been worn all day, bad lighting, who try too hard or who don’t try hard enough but who all need to try, but who are all without question beautiful, regardless of age or size. I mean, this movie features Dame Judi Dench, a woman in her 70’s, hosting the Folies Bergere! I love it!!! ~ Daniel Day-Lewis replaces Marcello Mastroianni as Guido, Fellini’s alter ego. My step-father (Italian) thought he was horribly miscast. He also said Daniel was playing Marcello Mastroianni (as opposed to Fellini), so I didn’t listen to him. But now I agree. Absolutely nothing about this performance evokes Guido or Marcello or Federico. His broodiness comes across and whineyness, he lacks the suavity to pass as an Italian auteur and little about his character suggests he is about to make what, despite all outward appearances, is a decidedly cerebral film. I don’t even think he was trying, so it might be misleading to say he failed. ~ Marion Cotillard replaces Anouk Aimée as Luisa, his wife. I am not convinced that Cotillard can give a bad performance of anything. But I dare say her portrayal of Louisa out-Louisa’d Anouk Aimée’s. And I say that as someone who positively idolizes Anouk Aimée. So it’s nothing against the original performance. Just a credit to Marion’s. Bravo. ~ Penélope Cruz replaces Sandra Milo as Carla, his lover. Ditto! I’m not a huge fan of Penelope Cruz, but not only does she give and unforgettable musical … er, performance, she is so real and vulnerable and her acting is superb. This could easily have be a caricature, but she went the more challenging rte. Her performance, there is something Italian neo-realist about it. ~ Nicole Kidman replaces Claudia Cardinale as Claudia, his muse. She’s no Claudia Cardinale… Claudia is supposed to represent the ideal woman, but the way this movie handles that fact that she isn’t is trite and gimmicky. BTW, I think this is also based on Anita Ekberg’s Trevi Fountain scene from La Dolce Vita. Maybe my memory is failing me. Anyway, Kidman confuses frostiness for enigma and chastity for femininity and doesn’t pull off the role. IMO. ~ Fergie replaces Eddra Gale as La Saraghina. Damn! You’d think there could only be one Saraghina. You’d be wrong. Fergie didn’t hold back – she went there. I’m impressed! That’s one of the most classic scenes in all filmdom & she didn’t look like she was re-enacting it. She looked like she was the actual person who had inspired Fellini’s scene. ~ Judi Dench as Lilli La Fleur. Again, I must be getting Alzheimer’s because I don’t remember who this was in the original. But the Dame can do no wrong. Brilliant as always. Wise without being smug, classy without being stuffy, irreverent without being shallow. And I want to see more older women like her in these kinds of parts. ~ Sophia Loren as Guido’s mother. What can I say about Sophia? Perfection. ~ Kate Hudson as the American publicist. Meh. Not brilliant, not terrible. In any other film this might have been a memorable performance, but Kate has too much competition for that in Nine. Also, she looked too much like her mother on “Laugh In,” dancing in lamé go-go boots – which were more evocative of late 60’s LA than early 60’s Rome. Unfortunately I’m blaming her for what is actually a larger problem with the film: Style. And lack thereof. There is an entire musical number devoted to the style of “Cinema Italiano” so I think we need to address it. As I stated at the beginning, 8 1/2 is the epitome of cool. You might not get the Jungian psychobabble or the care about some celebrity film director’s creative block, but you will be struck by the layer upon layer of existential cool. Last year was the first time in 17 years I did not buy a pair of Marcello Mastroianni sunglasses. How I adore those streamlined rectangular shades. Minimalist, intellectual, deliberate, chic. And I’m pretty sure Barbara Steele’s character in 8 1/2 is largely responsible for my own fashion sense, with her dark bob, dramatic eyes and monochromatic black ensembles… Fellini’s film is shot in black and white, yet one has the impression that had it been shot in color, all the costumes and set design would still be mostly black and white. Hats and sunglasses and spas all denote cool in and of themselves, but with the help of Fellini’s imagination and Italian design create Caligari-esqe compositions. Combined with dream-like pacing and spare dialogue, the film becomes more than a story; it becomes a work of art. Whimsical enough to avoid intimidating the audience, intimidating enough to keep them invested. The endless struggle between imagination and intellect, fantasy and reality. It’s what the whole film is about. The art direction and cinematography are the true shame about Nine. Lack of reference to Carl Jung and a less than hipster Guido should not kill the movie. Bad writing … well, this movie was waging an uphill battle to start with. But you just can’t make a movie about Fellini in homage to Fellini and use … standard Hollywood production values! Yes, some scenes do take a departure into real cinematic artistry, but they end up being the exceptions that prove the rule. Nine is content to be a story, a movie; it never becomes an undeniable work of art. It is the “apprentice-piece”, not the masterpiece. Please understand: I don’t dismiss all movies that fail to be masterpieces. All movies aren’t trying to be 8 1/2. Nine disappoints, but there is no tragedy here. 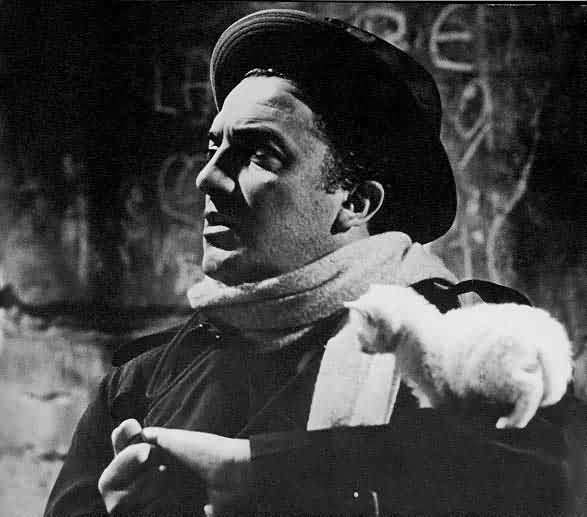 We’ll always have Fellini. And fortunately so will Mr. Marshall.